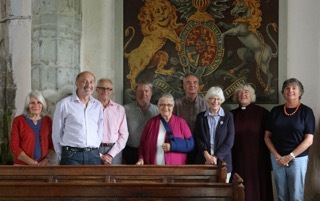 The Parochial Church Council is an official, partly–elected team that shares leadership responsibilities with Rev’d Tricia Fogden for the Parish of Stone in Oxney. In essence it exists ‘to promote in the parish the whole mission of the Church’. We meet four times per year and there is a Standing Committee set up to consider any urgent issues which may arise between our scheduled meetings. Extraordinary meetings of the PCC may be called if necessary. An Annual Parochial Church Meeting (APCM) takes place each April open to all parishioners. At this meeting reports are received on the life of the church and elections to the PCC are held. Only parishioners who are on the electoral roll of the church are eligible to vote in these elections. PCCs are charities and so PCC members are trustees. It is a charity by virtue of its objectives, which are basically the advancement of religion and the making of provision for public worship. The members of the PCC are the trustees of the charity and so the PCC must comply with all aspects of charity law. What does the PCC do? The Parochial Church Councils (Powers) Measure and The Charities Act govern our role and responsibilities. The PCC, together with the Priest in Charge, have responsibility for a whole range of matters. It is responsible for the financial affairs of the parish, deciding how the church’s money is to be spent and ensuring that it is financially solvent and well run, and able to deliver its charitable aims. The appointed Treasurer is required to make regular reports on the financial position to the PCC and is responsible for keeping proper accounting records, which are externally audited annually. We are responsible for the care and maintenance of the church building, church contents and churchyard. Members have the right to be consulted about major changes to the forms of worship used in the parish and the appointment of a new Priest in Charge. They are also consulted about any pastoral schemes affecting the parish. We consider and discuss matters concerning the Church of England or any other matters of religious or public interest. We make known and put into effect any provisions made by the diocesan or deanery synods. We give advice to the synods on any matters referred to us and will raise any matters that we consider appropriate to the synods. If you are interested in becoming a member of the PCC, please contact Rev’d Tricia Fogden – please see Church Contacts page. To be eligible to serve on the PCC you have to be aged 16+, have received communion in the Church of England at least three times in the last 12 months, and have been on the church electoral roll for at least six months (unless you are under 18).